William E. (Ed) Coulter, Ed.D. 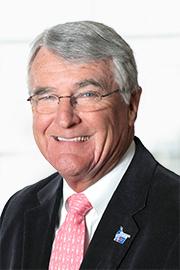 Dr. Ed Coulter is a member of the Board of Directors of the American Cancer Society Cancer Action Network (ACS CAN) and previously served on the American Cancer Society (the “Society”) Board of Directors. Dr. Coulter is a past Chair of the Mid-South Division of the Society and received the St. George National Award in 2015. In addition to his service to the Society and ACS CAN, Dr. Coulter has served on the Boards of Directors of the American Association of Community Colleges (serving as 2007 Chair of this 1,200-member organization), the Arkansas State Chamber of Commerce, the Baptist Medical Center System (35 years), and Integrity First Bank. He is a member of the Mountain Home Rotary Club and First Baptist Church of Mountain Home. Dr. Coulter was appointed Chancellor Emeritus of Arkansas State University Mountain Home in 2012. Prior to his retirement, he served as Chancellor of the University from 1995 through 2012. As founding Chancellor, Dr. Coulter guided efforts to purchase over 200 acres of land, constructed seven endowed major buildings, created all academic programs on campus and obtained full accreditations. Dr. Coulter earned his Bachelor of Science in Education from Ouachita Baptist University and his Master’s in Education and Doctorate in Education from the University of Arkansas. He and his wife Lucretia live on a 400-acre farm and are blessed with 7 children and 15 grandchildren.